It was a dramatic night of NBA action. 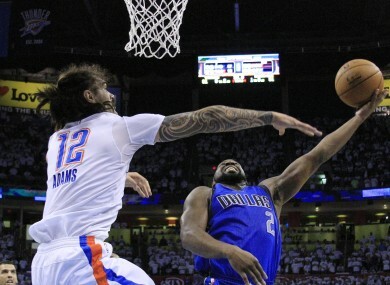 Steven Adams and Raymond Felton played key roles in last night's action. THE GOLDEN STATE Warriors made light work of the Houston Rockets in game two of their Western Conference opening round playoff game, despite have Steph Curry sidelined through injury. Curry rolled his ankle in game one but his side easily accounted for the visitors in his absence with Klay Thompson scoring a career high — for the playoffs — 34 points while Andre Iguodala (18), Shaun Livingston (16) and Draymond Green (12 points, 14 rebounds) also pitched in. James Harden top scored for the Rockets with 28 points, but his efforts on defence just about summed up his team’s attitude. With the Warriors cruising to a 115-106 victory, Curry could easily sit out the next two games and Golden State would sweep the series 4-0. There was much more drama in Oklahoma City Thunder’s 85-84 loss to the Dallas Mavericks. After Raymond Felton missed two free throws to put the Mavs three points up with seven seconds remaining, Kevin Durant thought he had one more chance to win the game for the home side as they raced down the court. However, even though both he and Russell Westbrook missed attempts to win, Steven Adams was sure his rebound went in before the the buzzer for the comeback victory. However, his effort was rightly ruled out as it was still touching his hand as the buzzer went off meaning the series is now tied 1-1 going into game three. In the night’s other game, the Toronto Raptors secured a 98-87 win over the Indiana Pacers to level up their series at one game apiece. Email “Warriors rout the Rockets while Thunder have buzzer-beating winner ruled out”. Feedback on “Warriors rout the Rockets while Thunder have buzzer-beating winner ruled out”.